1. Click two times on My Computer (icon on your desktop). 3. Click one time on Make New Connection to start the Internet connection wizard. 4. "My Connection" is highlighted. Just type CedarNet to replace "My Connection." Your computer should detect the modem you are using and automatically fill it into the "Select a Device" area. Click NEXT. 5. Enter the phone number: 232-4135 (The area code is not needed) Click NEXT. 7. 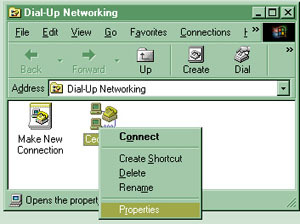 If your Dial-Up Networking screen didn't come back up, repeat Steps 1 and 2 above. This time see the new icon for CedarNet. With the RIGHT button on your mouse, click ONE time on that CedarNet icon. LEFT click ONE time on PROPERTIES (at the bottom of the five words in the box). 8. It will open up a window under the General tab (at the top). You should see the dial up number you entered (232-4135) in this window, as well as the modem your computer detected. Click once on SERVER TYPES- a tab at the top (or button, possibly at the bottom). 9. 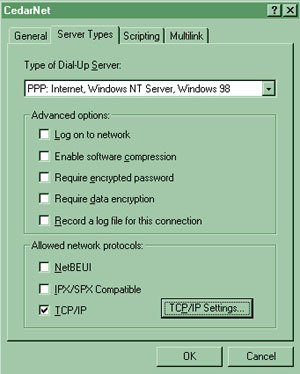 Only ONE checkmark is necessary in this window - TCP/IP. Do not click Enable Software Compression, it is not helpful with our server configuration. Click on any remaining checkmarks so they disappear. 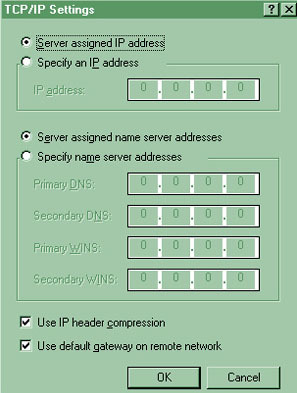 Click on TCP/IP settings. 10. A black dot should be in the first circle (Server assigned IP address) and third circle (Server assigned name server addresses). Both squares at the bottom are checked. Click OK two times to get back to Dial-Up Networking again. 11. Again RIGHT click Once on the CedarNet icon. LEFT click once on Create a Shortcut. It will ask if you want a shortcut placed on the desktop. YES! Close the window and notice you now have a CedarNet icon on your desktop. 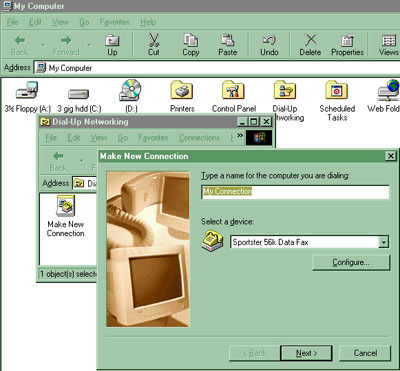 Double clicking on this icon will now connect you to the World Wide Web via CedarNet.